Toddlers love matching! And that’s a great thing because matching has so many benefits for this age group. 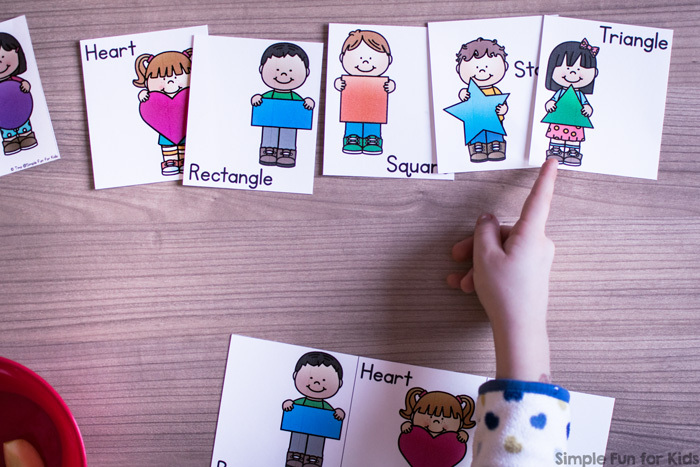 They work on visual discrimination, visual scanning, familiarity with one-dimensional print, learning to connect real objects with print, one-to-one correspondence, vocabulary, and more in addition to what they learn about the theme of the matching game. This Match This! 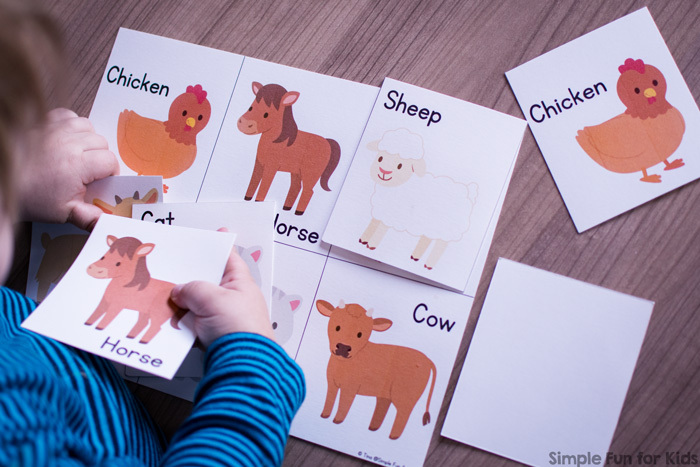 Matching Games for Toddlers ebook gives you a wide range of themes to choose from to set up a quick and simple, reusable matching game for your toddler. The matching cards are all the same size, so you can easily mix and match as many themes as you want for a bigger challenge. 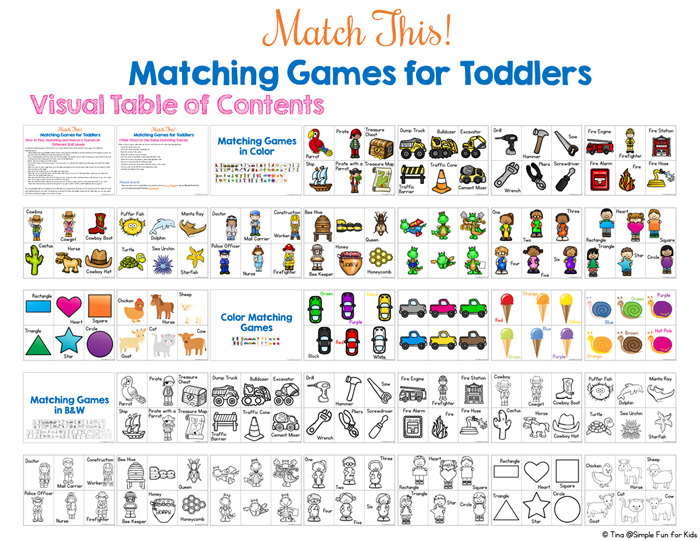 The book includes 30 different matching games with themes like shapes, numbers, colors, cars, construction vehicles, firefighters, ocean creatures, dragons, etc. There are colored and black and white versions and ones with and without words. Whatever you’re working on with your kids, there’s something in the book! Instructions for preparing the games and different ways to play at different skill levels as well as extension ideas are also provided. Question…does this download include 30 different matching games or only about 15 and each comes in color and black and white? 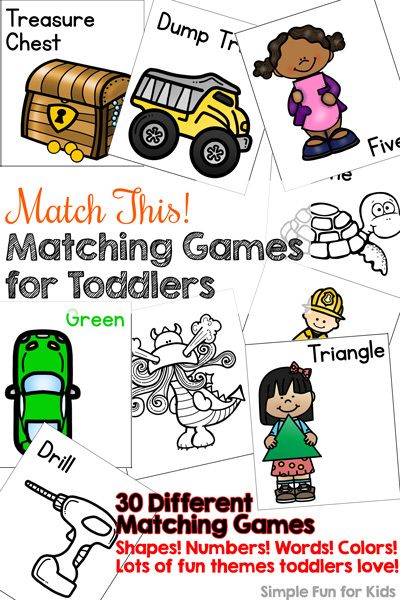 I consider it 30 different matching games, and so does my 2-year-old for sure. Combining colored and black-and-white versions really ups the level of difficulty. But I can see where you may hesitate to consider the black-and-white games different, so for full disclosure, there are 17 matching games in color and 13 games in black and white that show the same images as 13 other games in color. (The 4 color matching games are only available in color.) Let me know if you have any more questions!